Some speculatory questions before research are "Did he eat them to survive?" "Was he crazy" and "Did he just prefer the taste?" The basic question is "Was it really a part of the common diet for the people of his time period?" Every source I studied agreed that wild honey was highly common. Some people believe it was honey made from bees, and others believe that it refers to the tree gum (a tasteless but nutritious liquid) from the tamarisk tree; but all agree to its being common. With that being said, I'll focus on the outlandish part, the locusts. The fact that Matthew pointed out only John the Baptist's choice of food suggests to me that it was indeed an atypical dish. One source agrees with this point. Not only was it not ordinarily part of the diet of the time, but it's more likely that John the Baptist ate from the locust tree instead of actual locusts. Locusts were only in abundance during and shortly after the rainy season in Israel. Throughout the remainder of the year, any available locusts were found among greenery, not in the wilderness where John the Baptist supposedly was. However, locusts trees naturally thrive in wilderness regions. These trees produce a pod-like edible fruit that might look something like this picture. I expected most of my research to inform me that locusts were not a usual delicacy, so I was surprised to find that two sources say that it was completely normal. As part of the definition of "locust," my Vine's Concise Dictionary says that "they are used as food; the Arabs stew them with butter, after removing the head, legs and wings." One source agrees with this. Apparently, one didn't simply pop the locust into his or her mouth. There was a method. After removing the wings and legs, the locust's head would be removed, allowing the guts and intestines to flow out, leaving only the skin of the locust to eat. He says that just as we would think nothing about eating a pig's or chicken's flesh, the people of that time didn't think twice about eating the skin of a locust. He also adds that in ancient Greece and Rome, fried locusts, cicadas, and grasshoppers were considered a delicacy superior to the best meat or fish. These insects have enormous nutritional value. 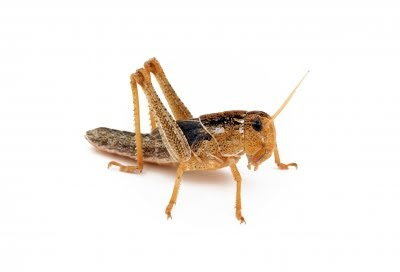 Grasshoppers, for example, are 60% protein versus chicken or beef with about 20%. I had no idea that the supposedly strange diet of John the Baptist was such a hot topic. I found much research on the subject, and, just as bonus information, I even found that there is a book devoted solely to his food choices. So, there is not a unanimous conclusion to this question, but I like to side with those who say that it was common. Imagining people "stewing" over the preparation of the locusts is more intriguing than imagining them saying, "Ah! A locust! Peter, get the sandal and squish it!" Also, thinking about a decapitated locust with guts flowing out just spices things up. Just for fun, I found this video of this strange boy reading Matthew 3:4 and eating a locust. Obviously, he doesn't know what he's doing, as he didn't properly remove the wings, legs, and head before consumption. Sheesh! Get it right. This was a very interesting post! I'd learned about John the Baptist eating locusts as well, but it had never seemed strange to me, growing up on stories of many people still having to do the same today in many third world contries to get the protein they need or even just to have something in their stomachs. This was interesting to read, and the locust tree fruit is something I'd never heard of before, so it's nice learning something new. Locust and wild honey is a fruit that grows up from the middle of a plant grown in Bermuda. It looks like a large ear of corn, is green in color, and is sweet tasting a little like banana. When ripe the grains loosen.